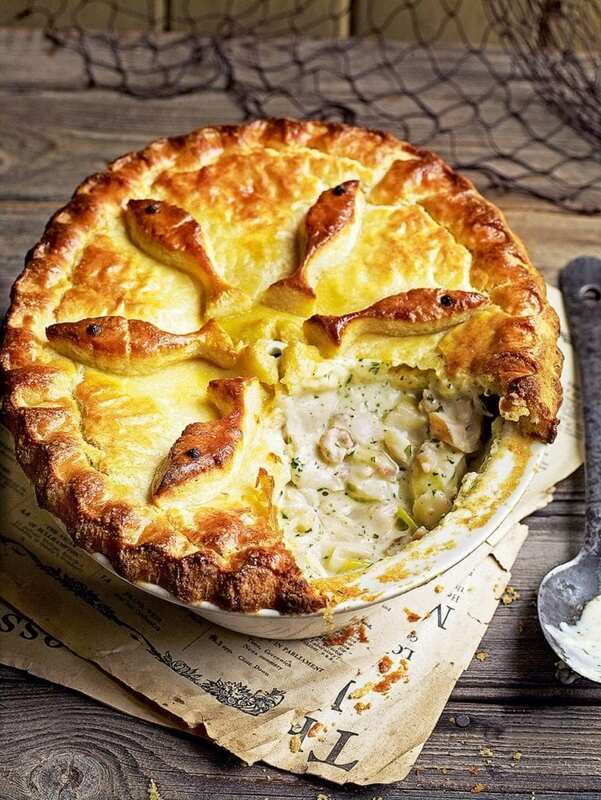 Debbie Major’s fish pie recipe is made with a crust of mashed potatoes and filled with a creamy fish filling – the ultimate in comfort food. Cook the potatoes for the pastry in a large pan of boiling salted water for 15 minutes or until tender. Drain well, then either pass through a potato ricer or mash until smooth. Leave to go cold. For the filling, melt 50g of the butter in a saucepan. Add the leek and season lightly, then cover and cook for 2-3 minutes until just soft. Stud the onion halves with the cloves and put them into a wide, shallow pan. Add the milk, cream, bay leaves and fish. Bring just up to the boil, then reduce the heat and simmer for 8 minutes or until the fish is just cooked. Lift the fish onto a plate and set aside until cool enough to handle. Strain the milk mixture into a jug, discarding the flavourings left in the sieve. Flake the cooled fish into a bowl in large pieces, discarding the skin and any bones. Stir in the shrimps/prawns and cooked leeks. Boil the eggs for 8 minutes, then drain and leave to cool. Peel and thickly slice. Meanwhile, melt the remaining 50g butter in a saucepan, then stir in the plain flour and cook gently for 1 minute. Remove from the heat and gradually stir in the strained milk mixture. Return to the heat and bring to the boil, stirring all the time. Reduce the heat and simmer for 10 minutes, stirring now and then, or until slightly reduced. Stir in the grated cheese and parsley, then taste and season with nutmeg, salt and pepper. Cool slightly. Stir three quarters of the sauce into the fish mixture, then spoon it into a 1.75 litre deep pie dish. Put a pie funnel in the centre of the filling (see tip), then arrange the eggs on top. Pour over the rest of the sauce, then set the pie dish aside for the filling to go cold (see make ahead). To make the pastry, sift the self-raising flour into a food processor and season with salt and pepper. Add the chilled butter and whizz briefly until the mixture looks like fine breadcrumbs. Add the cold mashed potato and mix quickly using the pulse button. Tip the mixture into a bowl, then add the water (how much will depend on how dry your potatoes are) and stir gently with a round-bladed knife until the mixture starts to stick together. Tip out onto a lightly floured surface, bring together gently into a ball, then knead very briefly until just smooth. Heat the oven to 200°C/fan180°C/gas 6. Roll out the pastry on a lightly floured surface into a circle slightly larger than the top of the pie dish, then cut a small cross in the centre for the pie funnel. Trim a thin strip all the way around the edge of the pastry, brush with a little beaten egg, then press it onto the rim of the dish and brush with a little more beaten egg. Lay the large pastry round over the dish so the funnel pokes through the cross, pressing firmly onto the rim of the dish. Trim away the excess pastry, then crimp the edges with your forefinger and thumb to form a better seal. Brush the top of the pie all over with beaten egg, then decorate with little fish or leaves cut from the pastry trimmings, if you like, and brush with egg. Bake for 45-50 minutes, covering loosely with a sheet of foil if it’s browning a bit too quickly, until the filling is bubbling hot and the pastry is an even golden brown. Remove the pie funnel and serve. If you don’t have a pie funnel, roll a few layers of foil into a tube and place upright in the centre of the pie dish. Make up to the end of step 6 a day ahead, then cover with cling film and chill. Bring back to room temperature before topping with the pastry and baking. Debbie says: “Potato pastry isn’t as crisp and crumbly as shortcrust, but it’s the perfect match for the creamy filling.